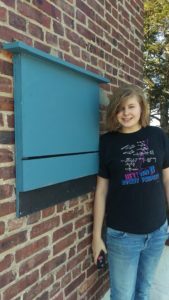 My 8th grade service project: building a bat box! The plight of the Indiana Bat has been on my radar since 2015, when I first researched this species as part of a blog series I wrote about endangered species in the Lower Raritan Watershed. At that time I became aware of several obstacles the bats face, including development of their natural habitats, overcrowding of colonies due to lack of habitat, increased exposure to predators (due to unsubstantial habitat cover) and White Nose Syndrome. This year, as I started my 8th grade service project, I knew I wanted to do something to help the bats. The thing was, I had no idea where to start. I downloaded bat box building instructions from the National Wildlife Federation, raised money to fund the project, and reached out to different entities to gain permission to install my bat box on their property. I had three possible sites in mind, two on New Brunswick park land and one on private property – all sites known to have bat activity. The City of New Brunswick never returned my emails or phone calls, but the landlord of an apartment complex gave me permission to install the bat box on the roof of his building. After securing permissions, I purchased supplies from Home Depot and constructed the bat box with help from my uncle. The building process of the bat box took just a few hours; I hand cut the wood, stained the wood with a non-toxic dark stain, assembled the bat box and painted the box. The whole process took less time than I thought, and I waited two weeks to install the box on April 17th. I decided to wait to install the bat box on April 17th because the 17th is National Bat Awareness Day. I had an amazing time completing the project, and I am very glad I built the bat box, because it helps address a very serious local environmental issue. I hope my act of service inspires you to also perform service in your local community.